I heard about Bingo Love in the early days of their Kickstarter. I recall that, as it gained broader attention beyond comics, my wife eventually heard about their campaign independently and she encouraged me to contribute, which I was pleased to say I'd already done. The story was ostensibly about two Black women who fall in love with each other in 1963, and how their deal with that relationship in a society that flatly rejects that notion. The story starts with both women as teenagers; Mari's just moved into town and Hazel is assigned to show her the ropes around school. They become fast friends and spend most their high school careers together. A fight between Mari and her grandmother, though, leads to an impromptu kiss between the two young women and they soon realize that they've both been in love for years, afraid to tell the other. Of course, they're promptly discovered and Mari is soon sent away to arranged marriage. We then follow Hazel as she gets on with her life. For the next half century, she plays the part of a stereotypical housewife before she has a chance encounter with Mari again. The decades fall away, and the two women -- now both grandmothers -- resume their relationship, but not without some emotional turmoil for their families. I was surprised by this book on many fronts. First, the story itself, while ultimately about Mari and Hazel's lives, covers most of their major life events in just a few pages. We've already learned a fair amount about the protagonists by that point, but that means we have very little time spent to do any character work on their kids and grandkids. And yet, in the brief snippets we do have of them, we get a lot of insights about their personalities -- enough that none of the secondary characters feel like stock characters just dropped in for the plot but are all fleshed-out, full-blooded individuals, even if they only speak on one or two pages. Kuods to Tee Franklin for having all these people so well-conceived. But a lot of credit here, I think, goes to artist Jenn St-Onge. Despite a fairly simplified, almost cartoony, drawing style, she does an amazing job capturing people's body language. I noticed right off how smooth and fluid he renditions of Hazel and Mari were, but all those secondary characters really come alive through her art as well. So whatever characterization we don't get via text and dialogue comes though very well in facial expressions and posture. I was really stunned by how natural everybody looked all the time -- every gesture, every expression, every pose was perfect for whatever that character was doing, thinking, and feeling at that moment. I wasn't familiar with her work before, but I'll definitely be keeping an eye out for it going forward. I was surprised, too, just how much emotional resonance the book held for me. I've obviously never been a gay Black woman in the 1960s, but this felt like about as close as I could get to experiencing that personally. Once their families get involved, the emotions naturally run all over the place, and they all really connected very well. Everyone's reactions always seemed genuine and truthful to themselves. I wouldn't go so far as to say this book is perfect; but it's about as close to it as I've seen in a long, long time. 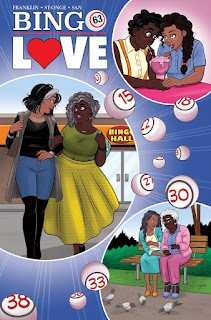 If you missed the Kickstarter, you don't have to worry -- it will be published again by Image Comics on, appropriately enough, February 14 -- Valentine's Day. On -isms: Is it REALLY a Sales Decision?